At least it is for me. The beginning of this year has truly been a whirlwind of activity. 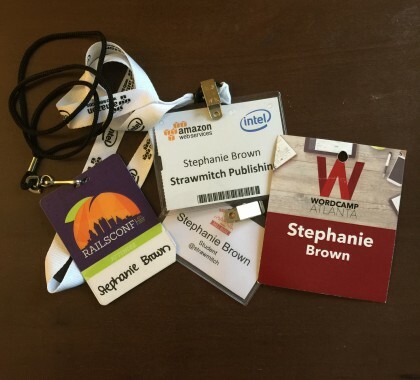 I literally attended four physical workshops and conferences in the past two months. And I won’t even talk about the events I let get past me because I was simply exhausted. In addition to the conferences I’ve been working on being much more diligent about attending tech meet-ups. I’m really tied into the community online so I rarely pass up an opportunity to register for the webinar of the moment. I admitted to AJ I often register for webinars to get access to the replays because invariably there will be several exciting things happening at the same time. If I didn’t count on the replays when would I have time to work? So, anyway, this season I attended WordCamp Atlanta, AWSome Day, Rails Bridge, and RailsConf. I missed DevNexus and I was kicking myself for that. I chose these particular events because they are directly related to what I’ve been working on this past year. I intend to write a full post on each event once I get some breathing room. The last 3 events occurred within days of each other and I’m still catching up on my personal projects. My hands are full with the android version of Beautiful Natural Hair Mag, the complimentary app detailing natural hair recipes women can make themselves from ingredients normally found in their kitchen, my resume and portfolio websites, and the website for my husband’s attorney services business. My hands are full but of course I wouldn’t have it any other way. Stay tuned for my recaps of the four conferences.